If you are one of those people who can remember their meal from the last weekend, have no problem in keeping records and remember the name of all your relatives with their relation to you then you are blessed with a good memory. There are people who envy you for having such good memory because even half of the world cannot remember what they have this morning for the breakfast. An Exceptional memory not just helps you in your daily life but can do wonders for your career as well. Just like every other quality you can list, good memory also comes handy when you start to look for the job. Yes, you read right, there are careers for people with a good memory. We are not saying you cannot have a successful career if you have normal memory, but a good memory helps you a lot. 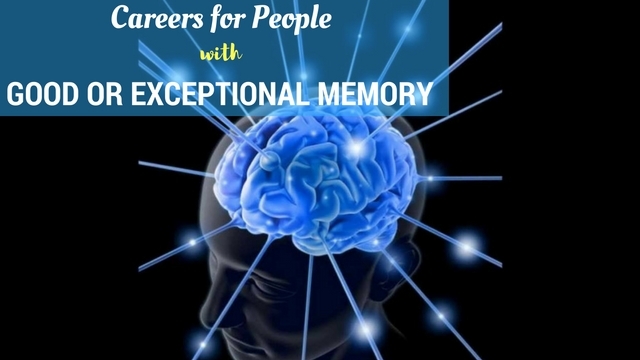 People can do wonders with a good memory and if you are wondering what type of careers are for people with good memory then read this article. In this article, we are going to discuss careers for people with good memory because not everyone is blessed with a good memory. People with good memory are hard to find, there are more people who cannot remember many things about their regular life and often face problems. Radio or television announcer is one of the careers that need good memory simply because they do lots of reading, memorizing and reciting on a public platform like television and radio where millions of people listen. The job of radio or television announcer need more than just good memory, but your work becomes incredibly easy if you have a good memory because stammering or forgetting something over radio or television can put a question mark to your career. Radio or television announcers have a heap of information on a daily basis, they need to remember it correctly and in a proper sequence when they do the show, they usually have written copy of what they are going to say during the show but they cannot read directly that’s why radio or television announcer is one of the careers that needs a good memory. Talk show hosts are those people who host talk shows with famous, intelligent and other important people, where they answer many questions and talk about their career and life. Talk show host is one of the careers where you need to remember all sorts of things during the show with the guest you are doing your talk show. Talk show hosts are the career that really needs good memory because you cannot afford to forget some line, stammering because you cannot remember correctly. As much as this career gives name and fame, good memory really helps a lot, but good memory is not the only thing you need to be good at. Being the talk show host is not the easiest job in any way. If you like to be the one, then be ready for the hard work because as much as this career looks promising, it has its own set of hard worship cut out. Acting is a highly glamorous and popular career with name, fame, and fortune where good acting skills and a good memory is what you need and of course really hard work. Acting is a career where you need a good memory to remember a script line by line without mistake so that you can perform your part accordingly. Generally, the common perception about actors is that they do nothing, just some acting and in return, they are super rich, people love them to the death and have everything on the beck and call but this is very far from the truth. Acting is a career that demands a lot from you, people only love those actors that perform really well and the actor does work hard, a lot harder than we think. Acting is a career where you can put your good memory to the perfect use by remembering all scripts, lines, and dialogue, but only if you have an extraordinary skill to act naturally. Well, the image of a politician is not picture perfect, even many people hate the politician so much that they don’t want to even associate with the word politician. All negativity aside, politician are one of those people who need a really good memory because they are the one who needs to remember so many things before taking any step. A politician is a respectable career because they are responsible for the well-being of so many people. If you want to put your memory to better use then this is the career for you where you can use your good memory as well as do make a positive change in people’s life. It needs a good memory If you want to become a writer, because they just have to write and for writing they need a creative head, then you are completely wrong. Professional writers have so many things going on at a time that without good memory he /she is hopeless. A writer always needs good memory because of the character they are writing, plots they are designing and the article they have to finish within the deadline. A good memory helps to keep all the information intact within their head so that they can work without wasting precious moments in reading the previous script, article, and character information. The writer may use their creative mind to write some excellent piece, but they also need a good memory because to connect all the plots, design in a way that make sense as well as they have to store previous information to carry on with the writing. If you have a good memory and skills for writing, then this is the career for you. Well, their name is good enough for the introduction. A project manager is what the title said, a manager who manages the whole project, which includes all the working, deadlines, management and staff. Project managers have lots of things to organize in a way so that the project can run smoothly without any problems and they can meet the deadline at the time. There is lots of stress and workload on the head of a project manager and they are asking for trouble if they do not have a good memory to remember all sorts of things which play important role in the project. If you have a good memory with excellent management skills as well as you are qualified to do so, then project manager is one of the most suitable careers for you. If you are thinking of being a journalist then you need a good memory because journalist usually gathers information about different events, incidents around the city, state, and the world and put together the information to prepare a report. A Journalist cannot do all their work without the good memory because they have loads of information to keep in mind from the single event in a day and usually they attend more than one event as well as past information. A journalist can be a reporter, writer, news reader or an interviewer depends on the job they got but they need a good memory to rely on because of the competitive environment and lots of information surrounds them all the time. A journalist needs other qualifications with a good memory, but good memory always comes handy in the field of journalism. If you are a lawyer but tend to forget things or points in the middle of an argument in the court, then how do you think you’re going to win the case? There are people who think that lawyers just have to read some books and they are all set to go, but the reality is; a lawyer works hard in reading and understanding laws during their education period, but even after they qualify as a lawyer they have loads of information to process and remember while representing and arguing the case in the court. You cannot think of a win if you cannot remember all the laws and defence tactics within the courtroom. If you have a good memory and a passion for justice, then this is the career for you. A good memory always helps lawyers in their win. Teaching is a job which includes lots of learning and then teaches all of the things to the students correctly and effectively. Teaching is a profession for those who have a good memory as well as a passion for teaching and helping children in learning. There are different levels of teaching from primary and secondary class teacher, play school teacher and college professor. They teach all students with a different mindset with different level, but it doesn’t mean that any of the levels is easier than others. Teachers are the ideals of a student who know everything, especially in the lower classes where students have an innocent mind. If you have a good memory and passion for teaching then being a teacher is an excellent career for you. This is not some highly paid job, waiter/waitress work long hours to get the decent amount of money, but their income also depends on the restaurant, hotel they are working in. Waiter/waitress is the job where a group of people takes care of every need of a customer in a hotel or a restaurant. We hardly see any waiter or waitress with a small notepad while taking our order because they have a good memory to keep the track of all orders, waiting list and finished meals. Waiter/ waitress jobs are the careers for those who have a good memory but don’t have any higher qualification or a degree because a waiter/waitress needs really good memory to keep up with the customers. Athletic coaches are those people who have good knowledge of various sports and can teach amateur or inexperienced athletics to play in a team or individually well. Just like school, college teacher, athletic coaches also need good memory because they have to remember all the details, rules and regulations about the game. They cannot afford to forget the rules or missing instruction because that put their student at high risk of injury. If you have a good memory and a passion for games, then you can be the athletic coach because along with game knowledge they also need a good memory. The difference between athletic coaches and fitness instructor is that fitness instructor teaches how to stay fit and athletic coach teaches how to play a game. Both professions are considered as some sort of teaching but need good memory because they cannot afford to forget a single rule. Fitness instructor actually works with a group or single person to train them about fitness routine, exercise to stay healthy and fit. There are many instructions that need to be followed in a gym or fitness class so a fitness instructor needs a good memory to remember all of this. You can do well in as a fitness trainer if you have a good memory and passion for a fit body. If you have a good memory and a passion, then no career path is difficult for you, but the careers we had discussed in the article need really good memory in order to succeed. So There are plenty of jobs for people with good memory.